MIYABI 5000 FCD Shotoh, 11cm blade. The shotoh, which roughly translates as “little knife”, is suited for preparing fruit, vegetables and smaller cuts of meat. It has a blade core of fine carbide steel for very good initial sharpness and cutting edge retention. 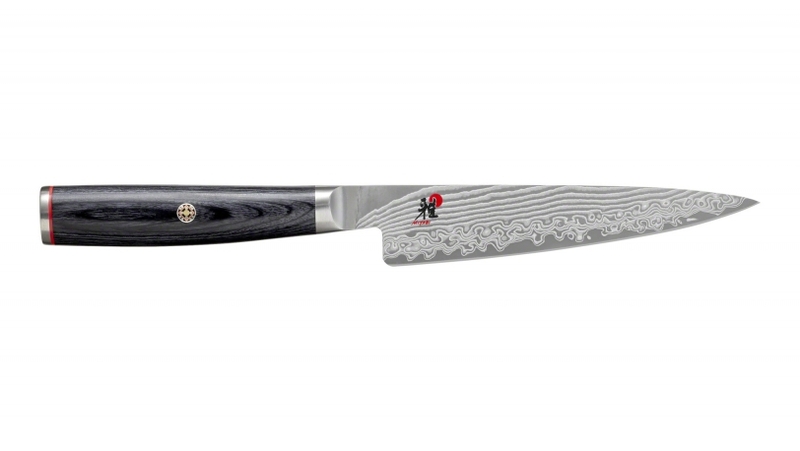 This FC61 core is embedded in 48 layers of steel which make up the unique Damascus-design pattern on the blade. The cutting edge is Honbazuke-honed which is a three-stage grinding, sharpening and polishing process that results in razor-like sharpness. The whole length of the cutting edge can be used as there is no finger guard. The smooth join between handle and bolster helps to prevent calluses forming on thumb and forefinger. To look after your knife in the best way, hand wash only and maintain and sharpen using a whetstone. Using glass, ceramic or stone cutting boards should be avoided as this can prematurely dull the cutting edge, so we’d recommend cutting on a wooden board.